Subaru's now famous Symmetrical All-Wheel Drive is 40 years old. 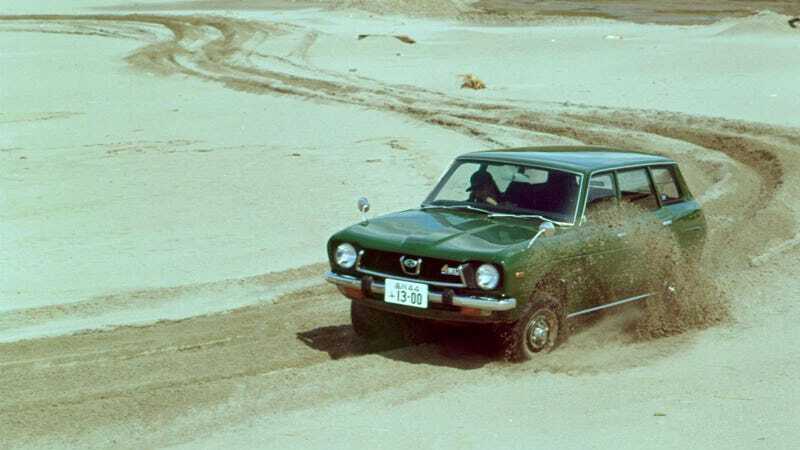 Contrary to what you might expect, the first couple of Subarus using it were not turbocharged racecars fighting against the mud and snow but rather affordable coupes and family cars in need of some extra grip. The Japanese company has been commited to the idea since introducing the first (optionally) AWD Leone estate in 1972. Here's a look at some of the highlights from more than four decades of putting power down through all four tires. From the estate came the BRAT (an acronym for Bi-drive Recreational All-terrain Transporter), which was basicly a Leone El Camino with first a 1.6-liter, then a 1.8 liter petrol engine. The US version had extra seats in the cargo area to save on taxes. This resulted in some fatalites, but that didn't bother Ronald Reagan, who had one from 1978 until 2008. The founder of Subaru Tecnica International (STI), Noriyuki Koseki decided to enter the World Rally Championship with three versions of the Leone. The coupe, sedan DL and RX Turbo racecars ran only a few rallies per season, but in 1986, they were the only ones using all-wheel drive with turbocharged power from the 1.8-liter boxer engine. In the eighties, Subaru rocked the kei car market with the 4WD Rex, which in Europe ran with the names Mini Jumbo, 600 and 700. Three month after its launch, the performance was upped by an optional turbocharger on the 544cc engine. If you reached 78 mph with it, you were probably using everything it had to offer. After giving the Rex optional full-time All-Wheel Drive and a rear-axle limited-slip differential for greater traction, Subaru started a new success story with the Legacy family car. All-Wheel Drive was an option across the whole model range, while the top of the line Legacy RS had a turbocharged 2.0-litre flat four with 217 bhp. People called it Lunacy. The SVX was the lovechild of Subaru's bravery and the genious of Giorgetto Giugiaro. As a first attempt to enter the luxury car market from the brand, it was pretty impressive from the outside, and very advanced under the metal. With a 3.3-liter six-cylinder producing 231 hp and 228 lb ft of torque, there was plenty of performance for the AWD system to handle, while some domestic market versions even had four-wheel steering. If that sounds complicated, your feelings are right. While the Leone was replaced by the brand new Impreza in 1992, Subaru was still using the aging Legacy as the base for their racecars. Colin McRae won the Rally of New Zealand with it scoring the brand's first World Rally Championship victory, but in the next year, the Prodrive-developed Impreza become the new star of the field. Subaru introduces the ‘STI' brand to its passenger cars in 1994, meaning that the WRX models are upgraded, often featuring blueprinted performance-tuned engines, transmissions and suspension set-ups. A legend is born, with the pink emblem showing that these Japanese cars are serious performance machines. Early STIs were built in limited numbers putting out "247 bhp." With the help of the Prodrive team, Colin McRae wins himself and the brand the World Rally Championship. The blue car with the golden wheels and the number 555 (tobacco ads were still allowed at the time) is remembered as one of the best rally racers ever produced, as Subaru went on winning three championships in a row with it. Colin McRae left after 1998 to continue with Ford. The Forester was one of the first crossover SUVs on the market. It rides well on tarmac, but thanks to it's raised height and all-wheel drive system (sending up to 50% of the engine's torque to the rear wheels), outperforms the rivals in the countryside. It was an instant success, securing Subaru's image as the most advanced manufacturer coming from Japan. The all new Impreza is launched. It looks a bit like a frog, and the Japanese domestic versions can be ordered with a 1.5-liter engine and front-wheel drive, but nobody cares, because proper turbocharged boxers are also available, with permanent All-Wheel Drive, WRX and STI tune, and even a very practical hatchback body style. Richard Burns wins the championship with the WRC car in 2001. With the exception of the BRZ, Subaru's lineup continues to offer AWD across all of its non sports car models. One of the most interesting examples is the Subaru XV Crosstrek, which offers a more off-road-focus take on the AWD setup without the additional power of a WRX.